Is This the Icon for a New All-in-One Messaging Service From Google? Developer Francois Beaufort, the guy who first pointed out that Chrome would be receiving Google Now-like notifications, posted up the screenshot you are seeing above to his G+ account, today. In the shot, we are seeing at least two things that have grabbed our attention – rich notifications in Chrome OS and an icon that looks a lot like one that would be for a messenger client of sorts. First, on the right is a shot of what “rich” notifications will look like in Chrome OS. As you can see, it shows very much in the style of Google Now. It also seems to be showing notifications for missed calls (Google Voice? ), users who have circled you (Google+), and messages from friends (Gmail or G+ Messenger). Unified messaging center? Umm, hell yes. Taking that a step further, the icon in the launch bar by the Google Drive icon is something we haven’t seen before. Beaufort mentioned in his G+ post with the photo that he “doesn’t know yet” what that icon is, followed by a winking smiley face. What’s he hinting at here? 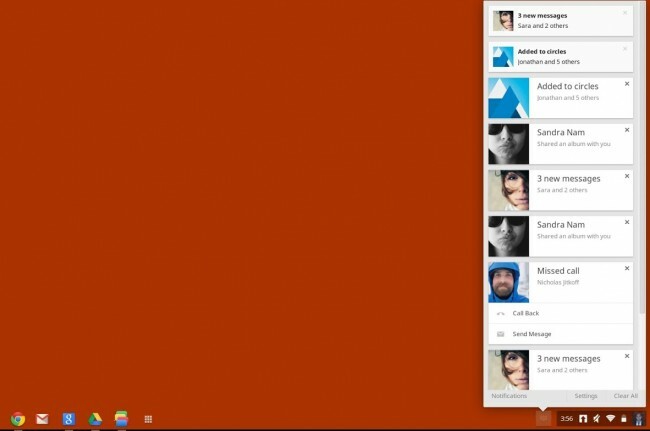 In the comments of his screenshot, a number of G+ users are praying for this to be a unified messaging app from Google. For far too long have we had to deal with separated Google Talk, Voice, Messenger, Gmail, G+, etc. But will it actually happen? At some point, it only makes sense that Google would try to release a unified messaging service. In fact, it should have been done long ago. But since they seem to have neglected Google Talk for the last two years, we can only hope that means they have been working on their next big solution. Oh, and that argument is also helped by the fact that the icon looks like four messaging icons piled onto one another. What do you think? Are we finally getting an all-in-one messaging solution from Google?